Kenya's Boniface Njagi (blue) and Mike Macharia square it off during their sparring bout at the Mombasa Open Tong-IL-Moo-Do International championship at Aga Khan Academy on Sunday. Hosts Kenya backed by a wild crowd at Aga Khan Academy, Mombasa bagged 24 gold medals, 31 silvers and 17 bronze to emerge first overall as the curtains came down on the Mombasa Open Tong-Il-Moo-Do International Championship on Sunday. The last day saw Kenya sweep all the medals in the girls’ 7-13 years, 45-48 kg, 60-63kg Junior boys and 49-52 kg boys sparring categories. Closest challengers Philippines came second with five gold medals. Iran was placed third with 3 gold and one bronze medal. Kenya’s Samson Mambo made light work of compatriot Joseph Mwarando in the second round to take the gold in the boys’ 60-63 kg category. Mambo utilized the combination of side piercing kicks and elbow strikes to gain momentum early and eventually emerged top. Kenyan Yona Mwanyika got his second medal of the tournament in the 49-52 kg boys' sparring category. Mwanyika used palm heel strikes and solid grappling ability to hold off a resurgent Abubakar Mwaisaingu (Kenya) who had to settle for silver. Hope Wayeko (Kenya) followed her impressive gold medal win on Saturday with a silver in the girls’ 7-13 years sparring category. Mwanatum Ismael was the winner with Nina Inan coming in third in a Kenyan sweep. Rozet Kusimba capped an impressive tournament with her second gold as she defeated Metrine Lugongo (Kenya) in the female 56-59 kg sparring category. Victoria Awino finished in third position for the bronze. 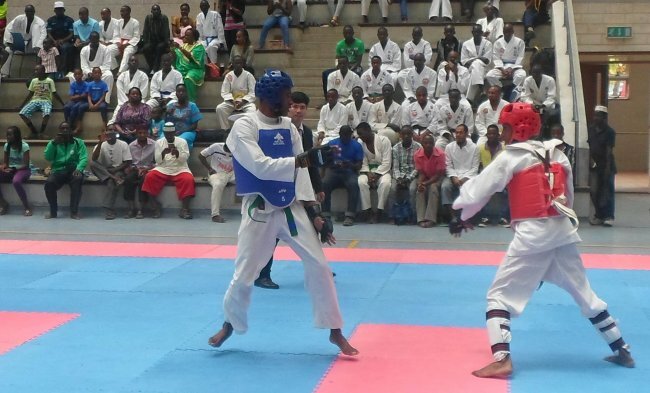 At the conclusion of the tournament Kenya Tong-Il-Moo-Do Federation Chairman Clarence Mwakio said that the national team is preparing for the three day Chon-Ju Championships to be held in South Korea from September 2. 1. Kenya 24 gold, 31 Silver, 17 Bronze; 2. Philippines 5 gold; 3, Iran 3 gold; 4. Ethiopia 2 gold. 28-32 years Individual Form (Male): 1. Nicky Rambuyon-34.7 (Philippines), Newton Sady -31.7 (Kenya), Moses Sitati-31.1 (Kenya); 18-22 years Male Individual Forms: 1.Elias Lagesse-33.5 (Ethiopia), 2. Elvis Malipe 32.4 (Kenya), 3. Daniel Getatume-31.7 (Ethiopia); 14-19 years Male Individual Forms (Male): 1. Samson Mambo-32.7(Kenya), 2. Collins Ndunda-32.6 (Kenya), 3. Yona Mwanyika-31.2 (Kenya); 23-27 years Individual Form (Male): 1. June Su Juma-33.3 (Kenya), 2. Edwin Musungu 33.1 (Kenya), 3. Evans Oduory-32.4 (Kenya); 23-32 years individual forms (Female): 1. Rozet Kusimba-40 (Kenya), 2. Jessica Wasike-38.5 (Kenya), 3. Victoria Onyango-38 (Kenya); Special Forms Male: 1.George Omolo-35.9 (Kenya), 2. Collins Otieno-35.3 (Kenya), 3. Edwin Musungu-34.6 (Kenya); Welterweight Junior Division: 1.Hassan Amjadi (Iran), 2.Juma Khamisi (Kenya); Male 40 years and above: Stephen Khaemba-31.3 (Kenya), Nassor Ali Moroa-25.0 (Ethiopia); Special Technique Team Forms: 1. Ethiopia-(32.7), 2.Thailand-(28.8), 3. Police Dog Unit (Kenya)-(28.7); Female Individual Forms 13 years and below: 1.Hope Wayeko-39.9 (Kenya), 2. Salma Abubakar (Kenya)-39.8, Nana Inan-38.1 (Kenya); 18-22 years Female: 1. Charissa Marie 44.8 (Philippines), 2. Salma Ali-42.6, 3. Chanyaphat Pansuwannakul (Thailand); Team Forms-Female: 1. Moi University-40.5 (Kenya), 2. Nzoia Sugar 40.1 (Kenya), 3. Police Dog Unit 38.1 (Kenya); Team Forms-Male: 1. Philippines-44.9, 2. Best Kickers-44.4 (Kenya), 3. Police Dog Unit-42.8 (Kenya); 85-99kg Men Sparring: 1. Mohamad Reza Dolatiyan (Iran), 2. Peter Njuguna, (Kenya), 3. Wycliffe Obura (Kenya); 100kg Men Sparring: 1. Hussein Heidari (Iran), 2. Koume Kassy (Ivory Coast); Welterweight Junior Division: 1. Hassan Amjadi, 2. Juma Khamisi (Kenya); 33-37 years Male Individual Form: 1. Vidal Mark Anthony-34.4 (Philippines), 2. Kouame Bohoussou,-31.5 (Ivory Coast), 3. Kouame Gorge 29.4 (Ivory Coast); 13 years Sparring Female: 1. Mwantum Ismael (Kenya), 2. Hope Wayeko (Kenya), 3. Nina Inan (Kenya); 60-63kg Junior Boys Sparring: 1. Samson Mambo (Kenya), 2. Joseph Mwarando (Kenya), 3. Andrew Wanje (Kenya); Individual Special Technique Male: 1. Baharu Heru-35.5 (Ethiopia), 2. Oluwafemi Johnson-35.1 (Nigeria), Nicky Rambuyon-34.6 (Philippines); 7-13years Sparring Male: 1. Alamin Ismael (Kenya), 2. Erick Mwaura (Kenya).